Door 44 Jewelry is officially dead. I’ve shut down my Etsy shop and I shuttered all of my social media accounts. I wanted to pick it back up again. I really did, but after five months away from my workbench, I have no desire to go back to it. This has been a strange year for me–a particularly difficult year, in certain ways, and a remarkably peaceful year in others. And so that strange dichotomy that’s preceded all of the critical turning points in my life seems to be back again. The season of change is upon me. I’ve had some fascinating experiences with nature in the months since I put Door 44 Jewelry on pause. There was the heart-stopping, awe-inspiring moment in Monument Valley Park the week that I decided to shutter the business for a while. I didn’t manage to capture an image of that incredible sight because my phone was to my ear instead of in my pocket where I could have grabbed it quickly and snapped a shot. I was out for an early morning walk that day when a friend called. She’d been having a difficult time, and she needed to vent. I always strive to be an open ear and a steady shoulder to lean on for my friends, so I listened quietly while she vented. Although I was struggling internally with my own challenges, I tried to push my own problems aside and focus on hers instead. And then along came the powerful wisdom of nature in the form of a Peregrine falcon. This falcon landed not ten feet in front of me on the trail. It had a dead pigeon in its clutch, and I could see that it was struggling to get a solid grip on its prey, which was just slightly smaller than the falcon itself. Our eyes met for a moment while the falcon adjusted its grip. It cocked its head, and I could almost hear it whisper to me, “Who is tending to your needs while you’re tending to hers?” Then it whisked its awkward burden to the other side of the creek where it began eating its meal. I couldn’t begin to tell you what my friend was saying in that moment. I was so stunned by that close encounter that I couldn’t hear a word. All I remember hearing was the soft rustle of feathers on gravel as the falcon adjusted its grip on the pigeon and lifted off to glide gracefully across the creek. When I was finally able to return my focus to the voice in my ear, I found that she was still venting away–completely oblivious to the fact that I’d been momentarily transported to another dimension through a spiritual encounter with powerful raptor. I didn’t bother telling her about that experience because she wouldn’t have understood the significance of it. I just resumed my walk and let her continue to vent until she arrived at her office and had to put away her phone. That encounter with the falcon rattled me, and the question it seemed to whisper in my ear nagged at me for a long time. Then, several weeks later (just after I started my new job), I had another unusual encounter with nature. This time it involved two mating Dragonflies that hitched a ride on my vehicle as I was returning to my office one day after lunch. I was sitting at a stop light when two dragonflies, linked in tandem, landed on the trim of the driver’s side window of my Jeep. If you’ve ever observed dragonflies in nature, you’ve probably noticed that they’re rarely still. So I was stunned to see not one, but two, dragonflies clinging to the felt weather strip around my window. They were so close and so still in that moment that I could see every detail of their delicate wings. The brown female and her iridescent blue mate seemed to be desperately in need of a respite from their tandem flight. The light turned green, and regrettably, I had to move. I tried to accelerate as gently as possible so as not to disturb them, but as traffic picked up speed, the male lost his grip on the window and the two tumbled off and away from my vehicle. Fortunately, they did so just as I was crossing a bridge over the same creek where I’d encountered the falcon. Perhaps they knew I was heading that direction, and they merely hitched a ride with me to the water. As with most of my unusual close encounters with nature, I was again struck with a bit of intuitive wisdom that came to me like a gentle whisper in my ear. This time, I was reminded of my husband and the bond that we share. It’s easy to lose sight of the things right in front of us. During the transition of shutting down my jewelry business and going back to working for someone else, I’d lost sight of him. Of us. I’d forgotten, briefly, that I was never in this alone. Even though we’d decided together that I should go back to working a regular job with a regular paycheck so we could more quickly achieve certain financial goals that we’d set for ourselves, I’d let myself slide into an unpleasant place where I felt isolated and alone. I’d been struggling with depression and sense of failure and loss after shuttering Door 44, and my new job was… well… let’s just say it’s quite a large step backwards for me in terms of both salary and level of responsibility. To say I’m underemployed is an understatement. Those two dragonflies reminded me, however, that the only thing that truly matters right now is my marriage. Everything else pales in comparison to the partnership I share with my husband, and my current job (insignificant as it may be) is helping us to achieve our mutual goals. It was at that point, after my visit from two very wise teachers in the form of mating dragonflies, that I started turning away from external distractions and began to focus more of my time and attention on the two things that truly matter in my life: my husband and our daughter. I uninstalled the Facebook app from my phone and deactivated my account for several weeks. I stopped taking phone calls from friends who only wanted to replay and analyze the drama in their own lives, and I started focusing pretty much exclusively on my own family. It was there, in the blissfully drama-free zone of our living room, that I finally found the peace and stillness I’d been looking for all along. And then I had the third and most recent strange encounter with nature. This time it was with a lone Damselfly while my husband and I were enjoying a day at the Cheyenne Mountain Zoo. Mike’s Camera was there that day, and my husband was anxious to try out some new photography equipment. We were at the Amur Tiger’s exhibit while Matt was trying out a new camera lens. The tiger, one of Matt’s favorite animals, was particularly active that morning . We’d already had one wonderful experience with this amazing animal as he came unusually close to us and seemed to acknowledge us with a friendly rub against the fence and satisfied twitch of the tail–the exact same body language our housecat, Rose, uses to welcome us home whenever we’ve been away. But then I’d noticed that a lone Damselfly landed on the fencepost right in front of me while Matt snapped photos of the tiger and dozens of strangers milled around us (you can see Matt’s photos here). Again, I was enchanted by the unexpected stillness of an insect that is almost perpetually in motion. The Damselfly rested peacefully on that post while I snapped photos of it with my phone. It sat there long enough that Matt noticed it, too, and we both photographed it with our respective cameras–he with his Cannon 550D and me with my LG V-10 phone camera. We joked about how everyone around us was straining to get a glimpse of the tiger, who was now playing hide-and-seek with the gathering crowd while we shared a magical moment with the lovely little Damselfly pictured above. This summer proved to be a period of transition for me. I’ve come to realize over the past few months that it doesn’t matter what I do with my spare time. Whether I’m making and selling jewelry or posting payments from insurance companies to patient accounts or overseeing the Accounts Receivable departments for three home health agencies in two different states, as I did at the last job I had before I got married… Those are all just pastimes. What’s really important to me now is whether or not I’m a good wife to my husband and a good mother to our daughter. Somehow through that brief connection with a startlingly still Damselfly, I managed to find my way back to feeling centered and grounded again. As we transition into Fall, my favorite season, I feel more deeply connected to my family than ever. I’m no longer interested in hearing about the drama in the lives of others; and I no longer devote significant amounts of time to social media. My focus is completely on my family now. And that’s precisely where it should be. Things are about to get real here at Door 44 Jewelry! I have a full year of sales under my belt, and I somehow managed to exceed my wildest expectations for my first year in business. That said, 2016 was a particularly challenging year for my family. It was a year of financial instability and uncertainty for we three Reamys. My husband was out of work twice last year, through no fault of his own. It’s just the nature of his business. Sometimes one contract ends before the next one is lined up, and sometimes it takes longer to line up the next gig than we expect. We were without an income for four of the last thirteen months as a result of two such incidents of poor timing, and that made me realize how vulnerable we are as a single income household. So, what’s a busy mom with an even busier 6th grader to do? I considered going back to work full time, naturally, but there are a multitude of reasons why that’s a less than ideal solution for our family. What really needs to happen, I decided, is that it’s time to level up my jewelry business to a point where it replaces my former salary as a project manager in the tech sector. 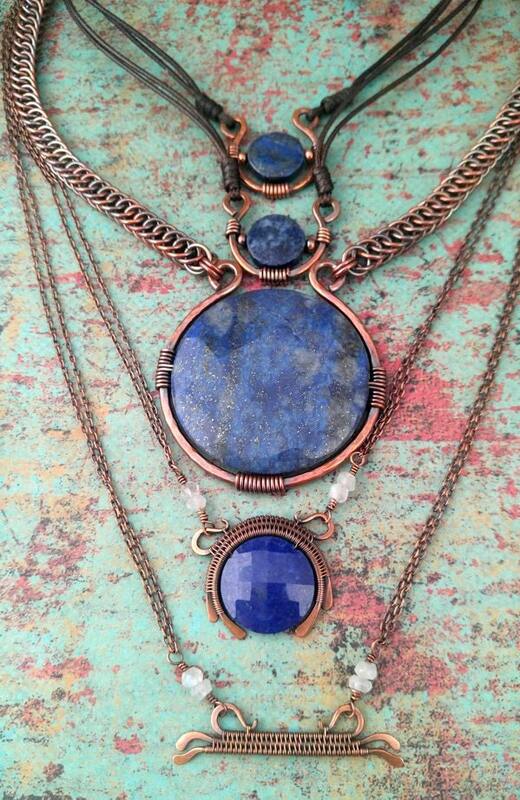 Last year when I launched Door 44 Jewelry, that felt like a pipe dream. Today it feels totally doable, and I’m going for it. I kicked off this year by participating in the 2017 Jewelry Brand Makeover Bootcamp hosted by Flourish & Thrive Academy, and what an eye-opener that was. I learned more about growing a jewelry business in that 10-day Bootcamp than I learned in an entire year of promoting my Etsy shop. The biggest revelation for me, though, is how much I’ve yet to learn. So, I’ll be dedicating the next eight weeks to a more in-depth Flourish & Thrive Academy course called Laying the Foundation. I’ve always suspected that I would ultimately end up working for myself someday. It’s not that I don’t play well with others. I do, when I’m on the right team. It’s finding that team that’s been a constant source of struggle for me in the corporate world. Too few companies are willing to do the right things for the right reasons. Corporate America is plagued with incompetent and unethical management, and the situation has only gotten worse since I joined the workforce as a young woman. I made a lot of money for some of my former employers through the years, but for all that hard work, I have little to show for it. I was never the prime beneficiary of my own effort, but that’s about to change. That 10-day Jewelry Brand Makeover Bootcamp showed me that it is completely within my own power to turn my love of jewelry into a lucrative business that will benefit my family in ways I’d only dreamed of until now. It’s high time that my family and I become the direct beneficiaries of my hard work. experience and my accounting education to set up scalable and sustainable business systems that will make my business run like a finely tuned machine. I see how I can tap into my web development and copy writing experience to build an engaging web presence for my jewelry, and I can’t wait to showcase the new collections I’m currently developing on the new website I’ll be building in February as I work through the Laying the Foundation course. 2017 is the year that I stop dreaming and start making those dreams my reality. I hope you’ll stay along for the ride because it’s going to be a lot of fun. A lot of work, yes, but it’s the kind of work that I can fully get behind because, for the first time in my working life, I’m totally free to do it my way. Why should the shareholders of some nameless, faceless corporation be the ones to benefit from your blood, sweat, and tears? Life is much too short for that nonsense. Do something you love, and do it well so you’re the one who reaps those rewards. Laptops & Tablets & Smartphones, Oh My! I spent nine years of my former life as a corporate drone working for a telecom company in Alaska. During that period, the company went on to become one of the first fully integrated telecom service providers in the country. Professionally, those were some of the best years of my career. Personally? Not so much. I was wired to the hilt. Even back then when wireless technology was relatively new and still extremely limited in rural Alaska, I was virtually accessible to my employer around the clock. I worked from home. I worked from the office. I traveled to some of the most remote regions of the state, and I was always tethered to my job by technology. To say my personal life suffered would be to imply that I actually had a personal life. I didn’t. I was married to my job, and not necessarily unhappily so. Not for the first seven or eight years, anyway; but as unbalanced marriages inevitably do, mine eventually crumbled. I was struck with the harsh realization on a redeye flight home to Alaska after visiting family in Colorado that, for someone so thoroughly connected through technology, I was woefully disconnected from the things that actually matter in life: friends, family, nature–the kinds of relationships that actually feed a spirit rather than isolate the spirit with the illusion of connectedness while slowly starving it to death. That startling realization marked the beginning of the end of my marriage to my employer. I quit my job a few months later, and I spent most of the following year getting reacquainted with myself. I disconnected all but the most essential communication services, and I refocused all of my attention on things that actually mattered, like my hopes, dreams, and creative impulses. I also moved back to Colorado that year, and thank goodness I did because I’d have never met and married my husband had I not cut those cords. Today marks the tenth anniversary of my return to Colorado. Ten years of being mostly unplugged from technology, and now I find myself being steadily reeled back into that tangled web. I suppose that’s a hazard of starting an online business–or any business, for that matter. This time, though, I’m determined to maintain a much healthier work/life balance because this time I do have a personal life. And a pretty wonderful one at that. For as long as I can remember, I’ve felt compelled to connect the dots all around me. As a child, I remember observing strange and erratic behavior in many of the adults in my life. My childhood was, well… let’s just say it was chaotic at best. The way that I coped with the chaos is that I learned to order it. I started paying attention to the nature of cause and effect, and the more I paid attention to those things, the more I began to see how all things are connected. The more I understood those connections, the more I was able to create some semblance of order in a world that could erupt in chaos at any moment. Creating jewelry is, for me, a personal expression of my understanding of connections. I suppose that’s why I’m so intensely (perhaps even compulsively) drawn to art forms that involve connections. As I look around at my workspace and the materials I choose to work with, what jumps out at me is that they all have one thing in common: they’re all used for various forms of weaving. The chains I weave are intricately connected together, link by link, in various forms that are as pleasing to the eye and to touch as they are mechanically strong and sound. The wire work that I do is similar to basket weaving in that it allows me to create forms that are both functional and beautiful. More importantly, it allows me to create forms that will last. Pieces that are timeless. As I begin my foray into working with knotting cords and micro macramé, I find myself once again exploring an art form that centers on connections. What starts out on my workbench as a chaotic jumble of individual cords gradually comes together to form a cohesive, ordered design. The sum of those once chaotic and disconnected individual parts join together as one to create a beautifully ordered and functional whole. I create jewelry in order to make sense of the chaos around me. And through the process of creating, I rediscover daily how I am connected to everything and everyone else around me. 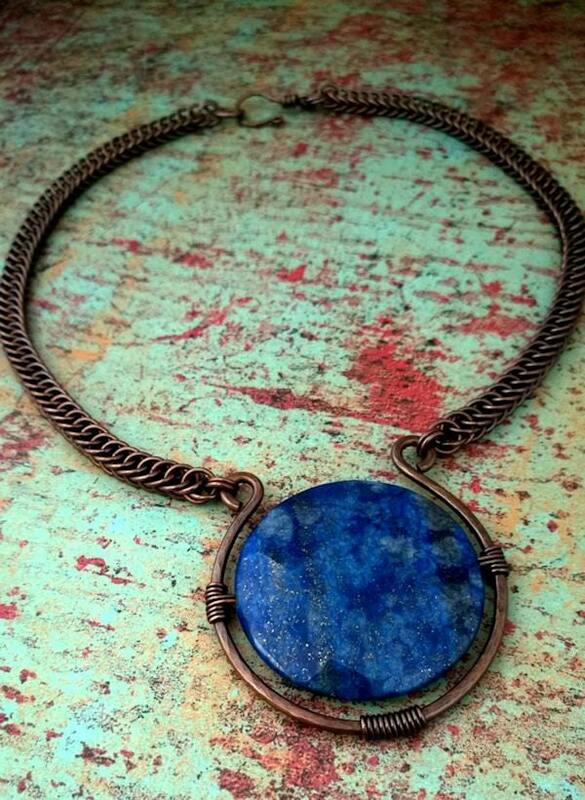 When you like a piece of Door 44 Jewelry that you see on Facebook, Pinterest or Twitter, I feel an instant connection to you. When you buy a piece of Door 44 Jewelry, I’m acutely aware of all the connections that might come from that single exchange–from my hands to yours–for better or worse. Perhaps that piece will go on to form another link in a chain of sisterhood, from your hands to those of someone you love. Maybe even on through multiple generations from you to a daughter, granddaughter, or niece who may pass it on again to the next generation of women of your family–all of whom will be irrevocably connected to me and perhaps my own daughter, should she choose to follow in my footsteps. Jewelry, as it turns out, is a wonderful means for me to connect with my 12-year-old stepdaughter. We’ve only known one another for about three years now, and we still have a great deal to learn about each other. But I do know for certain that we share a common love of jewelry. Teaching her to make jewelry and to appreciate it is proving to be perhaps the most powerful path toward an unbreakable bond that we share at this fragile phase of our mother/daughter relationship. Jewelry is all about connections, and I have a thing for connections. Thanks for allowing me to connect with you today. Change is good, right? Change means growth. Progress. New directions, perhaps? When I was young and single, I was also fairly driven and focused. I set goals, and I went after them. When one goal was achieved, I set another one and went after it with a single-minded ferocity unique to those who are responsible only for themselves. The operative word here, of course, is “I”. It’s easy to be goal oriented and focused when you’re the center of your own universe. Add a husband and daughter to that equation, however, and all that drive has to soften. The focus expands to a broader perspective. The single-minded ferocity gets redirected from personal interests to family interests. And personal goals? Well, they get prioritized along with everyone else’s. It’s been three months since my last post. When I wrote that post, I believed wholeheartedly that I’d have my real estate license by now, and I’d be working full time in sales. It was easily an attainable goal, until it wasn’t. By the end of November, it was clear that my husband needed to find a new job soon. On Christmas day, we got a huge wake-up call in the form of a major medical event on my side of the family. By the second week of January, the instability at my husband’s workplace came to a head, and we went from a single income to no income at all. Dead end. Time to change directions. Matt found a new job quickly. He started today, as a matter of fact, so he was unemployed for just one month. We did what we could to make the best of the situation. We tightened our budget and prepared ourselves for what could have been an extended period without a steady income. The fact that he was home during the day and able to shuttle our daughter back and forth to school between job interviews gave me an unexpected opportunity to spend a few precious days with my best friend, Jenn, before she moves to Reno, Nevada this month. As an added bonus, the eleven hours of solitude I had during the drive to and from Jenn’s current address in Kansas gave me a welcome opportunity to think, refocus, and reprioritize. Real estate is my dream job, but unfortunately, it’s also a job for which you have to spend money to make money. The loss of Matt’s income made me realize that we’re not quite in a place where we can comfortably afford to finance the pursuit of my dream job. We have more important objectives to meet first. So, the dream job is on hold for now. Losing our sole income, even if only briefly, made it clear that what we really need is multiple streams of income. The steadier, the better. Real estate hardly fits the bill as it provides sporadic income at best in the first year, yet the expenses are both immediate and steady. I’ve resisted selling my jewelry for as long as I’ve been making it, but desperate times call for drastic measures: Door 44 Jewelry was launched on January 28th. I’ve also resisted going back to my old line of work, but there are times to do what you want to do, and there are times to do what you must. I don’t remember exactly when or how my love affair with houses began. Was it when I attended my first Parade of Homes with my mom when I was ten? Or was it when I bought my first house at twenty-three? Perhaps it started even earlier. After all, I grew up in a small town with some pretty spectacular old homes and architecturally significant buildings. Whenever it started, it’s grown into a personal passion with very deep roots. Houses are infinitely fascinating to me because they say so much about the people who inhabit them. Materialistic people live in ostentatious homes. Humble people live in modest homes. Warmth and love are palpable in the homes of the kindest souls. A good interior designer can make any house look beautiful on the surface, but she can’t infuse a loveless home with warmth. Being a life-long student of interpersonal relationships, I suppose it’s only natural that I’d be drawn to residential real estate. The truth of the matter is that I’ve wanted to be a real estate broker since I bought my first house nearly twenty-five years ago. Having been single for all but the last two of those years, however, I never felt secure enough financially to make the leap from a corporate job with a steady paycheck and benefits to being self-employed and wholly dependent on the feast-or-famine nature of a commission-based income. Timing is everything, though, and the time is finally right for me to go after my dream job. Thanks to my incredibly supportive husband, Matt, I’ll soon be a licensed real estate broker. I’ll be wholly focused on preparing for my licensing exams over the next few weeks, so you may not hear much from me between now and the end of the year. Once I do get my license, however, I look forward to sharing my experience with you. My husband Matt and I are celebrating our second wedding anniversary today. Our marriage has been a bit of a wild ride, thus far. Not in a bad way, but we’ve dealt with an awful lot of change in what seems to be (at least in theory) a pretty short span of time. I don’t mean that in the sarcastic sense that I can order takeout or heat up a processed box of chemicals that sort of resembles food. I mean I have a genuine knack for cooking delicious and healthy meals from scratch. Who knew?! Cooking was never a priority for me while I was single. I regarded food largely as an inconvenient necessity that I had to address two or three times a day. Since getting married, though, I’ve discovered the joys of both cooking and eating. Dinners at the Reamys’ house are pretty spectacular. I love being part of something greater than myself. This one really wasn’t a huge revelation. I’ve always wanted to be part of something bigger. I’ve always been a company girl wherever I worked. I’ve always worked for the greatest good of whatever organization I was a part of at any point in my life. What’s always been missing, though, is the sense that my commitment was reciprocated. It wasn’t until I married my husband that I fully understood what it means to be part of something bigger than myself. Before Matt, I knew what it was to be a cog in a machine, a means to an end, a decoration on an arm, and a crutch. With Matt, I’m finally part of something that really is greater than the sum of its parts. It’s pretty amazing. And a little daunting at times, which brings me to my next point. I’m not as emotionally mature and rational as I like to think I am. Not having good role models as a kid made for a pretty tumultuous start to my career. I was headstrong and inflexible; and being a naturally strong personality, I wasn’t always the easiest person to get along with. It took a few years and a lot of hard knocks for me to develop the emotional maturity necessary to work well in a professional environment, but I eventually learned how to keep my cool when dealing with difficult coworkers. Dealing with my husband and stepdaughter are an entirely different ballgame, though. It’s easy to keep your cool with coworkers when you’re not emotionally vested in those relationships. Conflicts with people you love are infinitely more difficult to handle. Jobs will come and go, but the stakes are so much higher when the two most important relationships in your life depend on your ability to behave like an adult twenty-four hours a day, seven days a week. I have a far greater capacity for love than I ever imagined. I’ve been told all my life that I’m a selfish, self-absorbed, spoiled rotten brat. My own sis… um… a female relative who’s insisted she not be named on my “worldwide bully pulpit” called me a narcissist (among other poison barbs) recently. You hear those things often enough from people close to you, and you start to believe them. I’ve also been told that I’m not a team player by a few managers and supervisors in the past who didn’t like anyone challenging their authority. Let me tell you something about those statements: they’re wake-up calls. That’s the universe telling you, in no uncertain terms, that it’s time to do some interpersonal housekeeping. We are social creatures by nature. Thus, it is our nature to love and to collaborate in ways that are mutually beneficial—not one sided. Don’t let anyone tell you otherwise. If someone accuses you of not being a team player, it’s because you’re on the wrong team. If someone close to you spews toxic venom without provocation, it’s because they’re so filled with self-hatred and rage that they’re incapable of love. Walk away. Cut the cord, and give yourself permission to find the people you are meant to love—the ones who will love and appreciate you for who you are rather than who they need or want you to be. Find those people, and you will be amazed by your own capacity for love. You will undoubtedly discover, as I have, that to truly love and to be truly loved is an experience like no other. Finding it isn’t easy, but there’s no mistaking it once you do find your way back to the love that is your birthright. I always knew I’d ultimately marry the right man for me, but it took me a really long time to find him. Every time I walked away from someone I knew wasn’t The One, people would tell me that I’m too picky and that I’d never meet anyone who was perfect. They were wrong. They were wrong in so many ways, I can’t begin to count them. Matt isn’t perfect. Neither am I, but we’re perfect for one another; and that makes all the difference. Thank God I trusted myself and chose to ignore the naysayers because it was my own intuition that lead me to my husband. Great risk brings great reward, they say. It’s also true, then, that unwavering faith brings tremendous blessings. Happy anniversary, Matt. I love you. The original intent of this blog was to share my jewelry, my creative process, and the ways in which my life influences my jewelry and vice versa. My plan at the beginning of 2013 was to step my life-long jewelry hobby up to a business, but I got married that year instead. I thought I’d try again to launch the jewelry business in 2014, but instead I became a full-time mom when my stepdaughter came to live with her father and me. The first half of 2015 was an absolute whirlwind with job changes and lawyers and school and cello lessons and moving to a new city, but things are starting to settle down now, and I’m finally finding the time to get back to my personal goals. Having been out of the daily habit of making jewelry for a very long time, I decided to get back into the groove by honing my metalworking skills and experimenting with some new wire-wrapping techniques. The following images are the results of some of my first focused attempts at wire work in… well… a very long time. Nicole Hanna of Nicole Hanna Jewelry has long been an inspiration for me. 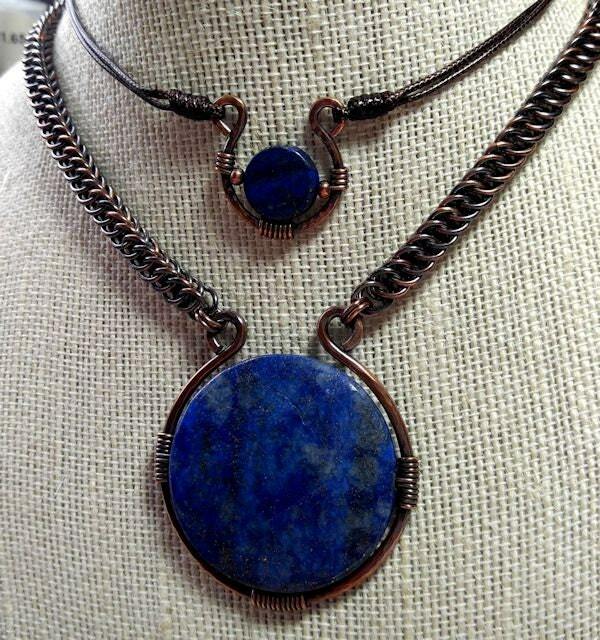 Where she finds the time and energy to do all that she does is beyond me, but besides making gorgeous jewelry and writing fabulous tutorials for aspiring wire wrappers, she also runs a great page on Facebook that’s become a sort of gathering place where artists help artists by sharing tips, techniques, and tutorials. The page is relatively new, but I’m amazed by how quickly its membership has exploded, and that’s largely because Nicole has a huge following in the wire wrapped jewelry world. Seriously, if you’ve never heard of her, it must be because you’re not a wire worker. Or a hand crafted jewelry lover. Anyway, long story short, Nicole has this way of getting people to step out of their comfort zone and create stuff they might not ordinarily attempt. This month she issued a challenge for group members to create something with a leaf theme using only wire, a single bead, and no tools besides wire cutters and a single pair of jewelry pliers. Dew-laden Aspen Leaf – design inspired by Nicole Hanna of Nicole Hanna Jewelry. It’s my interpretation of a dew-laden Aspen leaf in the fall. The colors are peaking here in Colorado this week, so it’s a timely tribute to my favorite season. The design is also a nod to Nicole Hanna’s style, which I adore even though I’ve never quite been able to do her designs justice. As a jewelry artist, I don’t wear a lot of jewelry that I didn’t make myself, but I make an exception for Nicole’s work. I own three Nicole Hanna originals, and I gush about her work like a proud parent whenever someone compliments me on one of those pieces. The second big challenge I took on this week was a pair of earrings designed by another jewelry rock star whose work I shamelessly worship. I mentioned Sarah Thompson in a previous post after I’d taken her online course through Craftsy.com. 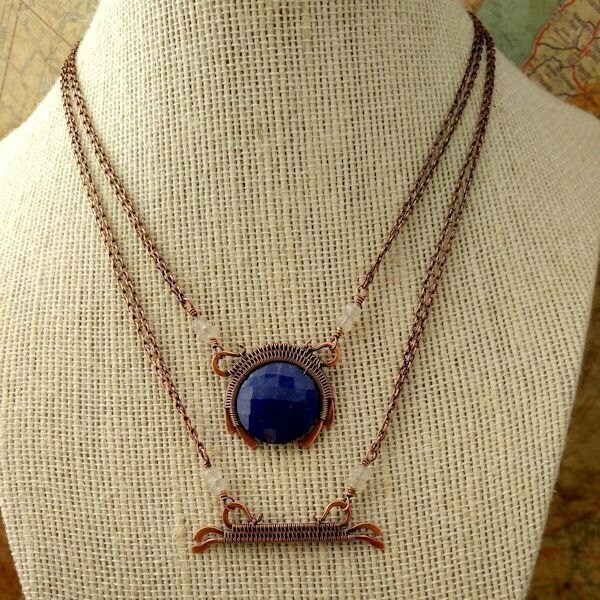 I first discovered Sarah’s work a couple of years ago while I was looking for wire wrapped inspiration on Etsy. It was there that I first saw her Scorpio earrings, and I fell in love with her work the moment I laid eyes on them. As luck would have it, Sarah included that particular earring design in her new book, Fine Art Wire Weaving. Fricken fabulous, aren’t they? I can’t begin to explain how inspiring her work is, so go check it our yourself at Sarah-n-Dippity! And tell her I said hello. Cuz that’s not creepy at all. Now that I’m finally back to focusing on jewelry, this blog might start to have fewer words and more pictures. Probably not a bad thing, given my tendency to ramble. Oh, one more thing… Welcome to all the new followers I’ve picked up over the past few weeks. Thank you for taking the time to read and share my blog. Now, go make something beautiful!